After having the Short-Ram style intake on for a couple years, I decided to make a prototype Cold Air Intake (CAI). I didn't notice much of a difference in performance from the Short-Ram, but I did notice that the engine no longer bogs down after the engine is warm. The rule of thumb is that for every 10 Degrees warmer than room temp, you lose 1hp. 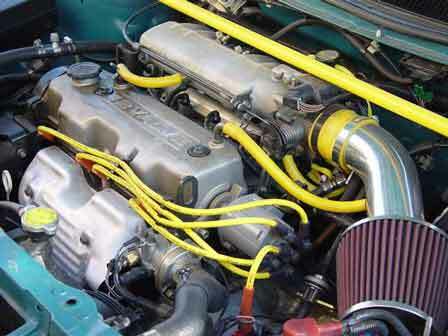 With that in mind, the Short-Ram style intake should only be used in cold climates, or when your engine is running cool. I upgraded the spark plugs to Bosch Platinum 4+ and made custom Accel 8mm plug wires. I did some reading and found out that anything bigger than 8.5mm for plug wires can be worse for performance due to the fact that the wires start acting like a capacitor and store some of the energy instead of releasing it all. To keep this from occuring, it is advised that you get a performance ignition controller, something like an MSD 6A. I also added an MSD Blaster coil to help increase the discharge. 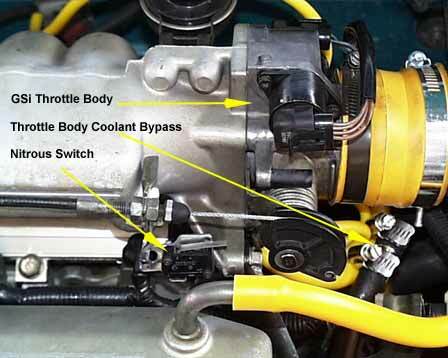 If I can find a dirt cheap MSD 6a ignition controller, I'll install it, but since I am doing an engine swap, and the RS engine uses a DIS(Direct Ignition system-'distributorless') type ignition, it would be a waste. I also installed a Circle Earth Grounging kit. Makes for brighter lights and a slight increase in torque. I discovered a hole in my radiator and knew that I had better replace it quick. I went to the junkyard and pulled one out of an Automatic Storm and noticed that the radiator was TWICE as thick and the one in the Manual Storm. 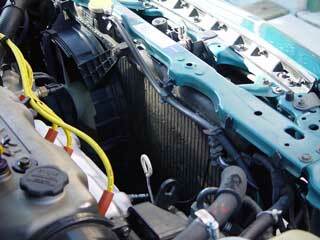 It also has a transmission fluid cooler in the bottom. Once I installed it in my car, I went for a run and noticed that the engine temp was about half of where it was before. 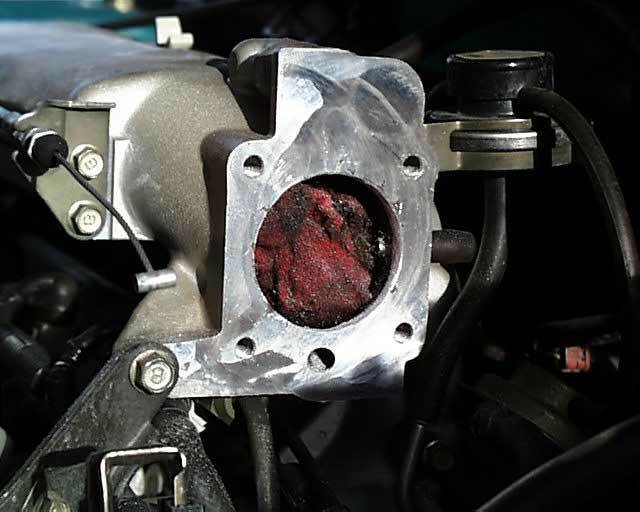 The engine tempature is consistantly about the 1/3 mark whereas it was around the 1/2 mark with the old radiator. You just gotta love a free upgrade like that without even trying. . .
Update: Dammit! Now this radiator has a hole in it too. . .I think I'll just pull it out and patch this one. I don't get it, it holds fluid for about 3-4 weeks, then the next thing I know, the engine temp is at the half way mark again. I looked under the car, and saw a couple drops. So, I either have a leak in the radiator or in one of the hoses, or, the freeze plug is leaking. I sure hope I haven't blown the head gasket or something like that. . .
Update again: Well, I was in a bind and needed a temp fix, fo I actually dumed that STP StopLeak goop in the radiator. . .no more leaks, but I hope it doesn't clog up the rest of the works. Update again: Found where the leak is-the return for the ThrottleBody coolant line, where it re-enters the engine at the Thermostat housing. 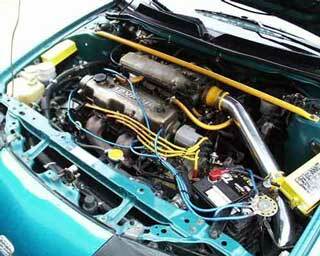 I'll get that fixed when I pull the engine to do the swap with the RS engine.